Pre-book your transfer to airport and let yourself have fun while in Las Vegas! This private van transfer is available for up to 14 passengers. Please provide your airline and hotel information at the time of booking. You will be met by your professional driver who will assist your and your group to your comfortable passenger van. 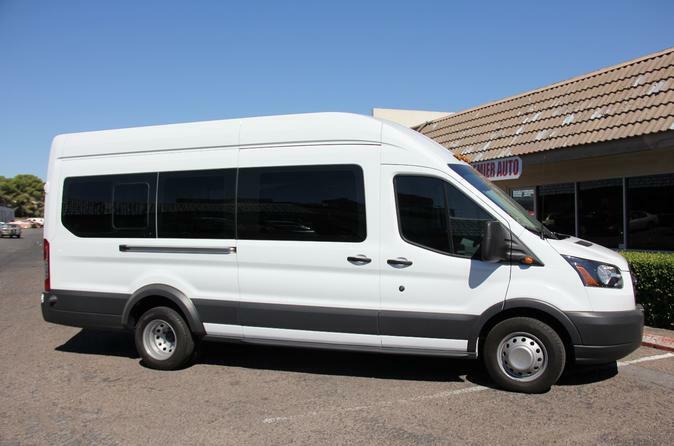 Ensure that your Las Vegas vacation is stress free by pre-booking your private transfer out to McCarran International Airport from any of the greater Las Vegas hotels.These private vans can accommodate up to 14 passengers and the price is inclusive of all taxes and fees. Terms and conditions: On arrival transfer guide and/or driver will be at the luggage carousel waiting for passengers with a sign with the name of the same for identification. We use flight tracker software which checked the flight arrival time to ensure that the transport and guide are on schedule for our passengers. The transfer must be completed in one hour from the time of arrival of the aircraft. Passenger time starts when the plane lands. This means that passengers have to be told to go straight to the site to pick up the luggage. If passengers or group is not identified 45 minutes after the plane land, transportation companies consider "no show". For those outputs which are not airport the same time applies and the location of pick up is specified on the confirmation. Terminal 1 - Monorail Blue line. Aviation Company, Allegiant Air, American Airlines, Delta Airlines, Delta, Omni, Southwest, Spirit Airlines, Us Airways. Terminal 3 - Monorail Red line. International Airlines: Aeromexico, Air Canada, British Airways, Condor, Copa, Edelweiss, Interjet, Korean Air, Magnicharters, Sunwing, Thomas Cook, Virgin Atlantic, Viva Aerobus, volar, West Jet. For outputs that are not airport the same terms apply and the transfer waiting time is 30 min and place of pick up will be specified on the confirmations sent. Clients going to wrong terminal may cause extra charge of airport fee and 30 minutes extra charge on the charter of 1 hour ( charge locally) or a no show if client do not contact dispatch at 702-489-9019 or 1844-478-2225.